A Student Story from 1971/2 … consisting of snippets of experiences and images as a series of points …. North West Island is the largest coral cay in the Capricorn Group with surrounding reef, dense tall pisonia forest, nesting turtles and seabirds. It is located north-east of Gladstone. There is self-sufficient camping but be sure to take water and a fuel stove. Campsite bookings are necessary. You need a boat to use to fully enjoy it. Introduction: In 1971 we planned to spend three weeks of our student Christmas holidays on North West Island. This was repeated in 1972 by a similar group for two weeks. This island is about 40 miles or seventy kilometres out to sea from Gladstone in the Capricorn group of islands on the Great Barrier Reef. To get there, we had to charter a boat which could make the all night, eight hour trip to the island. It was the Gladstone Star. Early in the morning, the island loomed up on the horizon. It arose as a thin green sliver of trees on an azure blue sea. It floated between sea and sky indicated by a wheeling mass of black birds in the lighter sky. These were nesting mutton birds and noddy terns, so we soon discovered. People there: Rodney Catton, Geoff Catton, Neville Rowden, Gail Mason, Carolyn Knight, Nerolie Goss, Tony & Sherie Truscott, Ken Aitken, Trevor Morgan, Graeme & Gloria Higgins, Alan Hadley & two small children, David & Pattie Blanch. We all in our early 20’s and I was only 22 in 1971. Approach to The Island: Later, as we approached the island, the deep blue of the open ocean gave way to a greener, more aquamarine colour with the emerging coral reef. The colour soon became a light turquoise green. We came in near the shallow reef which at that time of the tide, was covered with about a metre of water. The dingy was lowered to transport all us and all of our equipment to the island. On arriving on the island, we discovered that the island was formed of deep coarse coral sand with a fringe of wispy casuarina trees. The island itself was covered with a dense forest of broad leaved psionia trees. It was like being in dense subtropical rainforest consisting of only one tree. The trunks of these trees could reach to about a metre in diameter with branches and leaves high overhead which merged with the next tree to form a big shady canopy. In the centre of the island, tree height could reach twenty metres or so. Psionia trees are known as catchbirdtrees, birdcatcher trees or birdlime trees because their sticky seeds reportedly trap small birds. These sticky seeds disperse around the island by attaching them to birds. Making Camp: Finding a camping area was easy. We pitched the several tents in a group together under the canopy of trees within eyesight of the covered reef flat …. A lighter aquamarine colour. We could hear the wash of the incoming tide over the reef flat. Exploring the island: One of the first things we did as soon as we had made camp, was to explore the island. The island could be entirely walked by walking on the beach for about half hour. The island consisted of white coral sand blown up by the action of the sea. 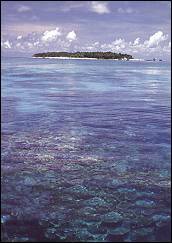 The island was near the centre of a very large elongated coral reef several kilometres long. This reef was covered by several metres of water at high tide or completely exposed at low tide. Shallow sand coloured tidal pools interlaced this tidal flat with some of the pools up to one meter deep and several meters across. Often bright green parrot fish would scuttle out from the shallow waters to hide under the overhanging coral of these deeper pools. One of the first things we immediately noticed, was that the whole island was a mutton bird rookery (Shearwaters). Their underground burrows littered the whole island. The birds burrowed everywhere in the soft grey coral sand under the entire pisonia forest. They burrowed down then turned the burrow parallel with the surface for up to two or three metres to the nesting chamber. Walking through the pisonia forest, was a tortuous process of falling intermittently into new and old burrows. It was a bit tedious, extracting oneself out of the continuous and sudden subsidence. Mutton Birds: Early one morning we noticed mutton birds streaming out from the western side of the island to go out to sea on their daily fishing forages. On another morning, several of us got up very early to investigate this phenomena. What we found was very unusual … the birds were coalescing together in black snakelike lines from all over the island and gathering at this central point on this western side …. As the trees were so thick and they couldn’t fly from branch to branch like other birds and needed a gliding vantage point to take off. What they were doing was converging on a mutton bird runway …. Streams of them … with two and three abreast …. They begin flapping their ungainly wings and then would run in an unsteady gait together down the runway … when they had emerged from the tree cover they would have enough momentum to glide over the two metre slope to the reef flat and let the upwards sea drafts lift them to greater heights ….. what you saw was a black current of dispersing mutton birds pouring out from the tree-line. At night it was a different matter … the birds would be flying overhead and would decide to land in a very ungainly manner … this was by plummeting through the trees near their burrow to the ground below … it was in a near wing breaking manner which often landed them on our table at night or wherever they landed … they would immediately try and run away with their ungainly gait … into our tent or us if we were in the way ..… knocking over whatever was in their path …… we would grab them and heave them out of our tent so they could find an unobstructed way to their young in their burrows. We had sleep all night long through an incessant calling of their young ….. it was like a thousand babies crying all night. In contrast to the mutton birds were the small black nodding terns with white rings around their eyes ….. these very graceful terns which fluttered from tree to tree ..… they had made nests like small fragile twig-like cups fastened to the horizontal branches of the pisonia trees. Drinking Water: As there was no water on the island we had to bring our own. Rodney was our camping organizer. He had carefully calculated how much water would be used by fifteen people over three weeks of camping. The water was supplied in small oil drums lined with a black garbage bag. The drums were brought up from Brisbane in a trailer and filled with water at the ship departure point in Gladstone. The water was only for drinking, cooking and definitely not for washing. Washing was when we went swimming or skin diving for the day. Weatherboard Shed: There was an old shed on the island which was the remains of a former old mutton bird factory which processed the birds for their rich mutton bird oil. Behind the shed, some earlier visitors had left a surf ski. I rigged this ski with an outrigger and rough sail from some scrap timber nearby. I proceeded to sail my new innovation the next morning out over the reef on an incoming tide. As I had only an improvised paddle, I was blown by the slight sea breeze over the reef into deeper water I tried to paddle furiously. By lowering the sail, I managed to bring my ungainly craft into shore. Because I had my knees propped up in front of me for about an hour, my new skin was almost in blisters with very severe sunburn by the next day. This was a hard island lesson I learnt from the experience. Ken …. Lost: One afternoon, I told everyone I was going for a walk around the entire island. I would also take my surf ski, towing and paddling as I went. It took about half an hour to run the entire perimeter of the island on the coral beach. There was a very big thunderstorm brewing on the mainland to the west. I was half way around the island when the thunderstorm broke with torrential rain over the island. The surf ski became too heavy to paddle or tow in the rain so I immediately beached the surf ski with the intention of coming back at a later time. I continued walking round the beach in the driving rain back to the camp. I arrived back at camp in a very bedraggled state after the rain had ceased. Everyone was really relieved as they all believed I had been blown out to sea. Fishing: A dedicated party of us would go out everyday to fish by line or speargun. In the warm tropical air, our fruit and vegetables would quickly go off within a few days. For a party of fifteen people, we had to rely on fish to supplement our food. On the incoming tide, we would skin dive with mask, snorkel and speargun. On the outgoing tide, we would fish from the exposed edge of the reef into the deeper water. On our first week on the island for our first trip, David Blanch (a Gladstone friend of our party), had come over a few days later on another barge. He had hired at a reasonable rate, an aluminum dingy with outboard motor. Several of us would go out at night to fish in the deeper drop off from the edge of the reef with the incoming tide. We really got to catching many big red emperor sweetlip …. a very desirable fish for those who do not know. When they took the bait, they would run with the bait. The handline would run out and pull lightly in our fingers. We had to have heavier handlines as the lighter lines would easily abrade on the coral knobs. The fish otherwise would snap the lines off by running under coral ledges. At night a few of us went down to the beach to fish the incoming tide as well. As the tide came in over the shallow reef, bigger fish moved in to pick any food scraps left by the exposing tide. Often we would pick up fish like red emperor sweetlip and other assorted fish. Rodney had a thick handline out with one loop over his shoulder. He had some fish flesh bait on the hook. Suddenly, a big fish picked up the bait and ran with the line. It snapped the line and the whiplash of the breaking line on his arm was so strong, it left a big red weal down his left arm. It was probably a small reef shark which often frequented the reef waters at late high tide. Turtles: At night we would often go out with torches looking for egg laying female turtles. The turtles would come up on the incoming tide and haul themselves high up on the dry sand. They would dig out a half meter deep hole with their back flipper. They would lay in a patient and laborious manner about a dozen to twenty roundish leathery 50 mm wide eggs over about an hour of time. She would then careful to fill the hole with sand and cover the eggs. She would then patiently haul herself back to the outgoing tide. Weeks after she had departed, the sun warmed sand enabled the eggs to grow and hatch. We would often find baby turtles frantically making a beeline across bare sand, for the water at odd times in the day. They could attacked by birds or they could also be exposed to all sorts of danger as with large fish once they entered their watery world. One time we tried frying and eating an egg. We all found them to be quite unlike hen eggs as they were very granular in the yolk …. very unpalatable. Turtles would come up on the cay beaches to lay their eggs, from late October until the end of February and turtle hatchlings emerge from their nests to make their way to the sea from late December to the end of April. One night I was down by myself, fishing the beach. As I was walking back to camp along the beach, I intersected with a female turtle returning to the waters of the outgoing tide, from a egg lying session on the high sand. As she entered the dark water, I dropped my fishing gear on the sand. As I was in my swimming gear and it was hot summer night, I grasped the front rigid edge of her carapace. As she tried to swim away from the shore, she churned through the warm water with her flippers, I was towed a behind her as a free skier. Diving (first trip): Early in the first week of being on the island, I was out in deep water with my flatmate, Trevor. He beckoned me come quickly to him as he had just seen a large shark. He wanted me to bring my powerhead on my speargun. A powerhead is a stainless barrel which screws onto the front of your spear on a speargun. It contains a 0.303 bullet inside an internal chamber. When the outer barrel with the bullet, slides up on impact on a firing pin, it causes the bullet to explode into whatever it impacts upon ie. shark. It discharges with a loud thump in the water. Whether it is a shark or whatever, I wouldn’t like to be the one on the end of the receiving discharge. Such a discharge will kill a large shark if you hit it in the head. Diving (second trip): On another particular day I was out skin-diving with a whole group of guys in the inflatable boat belonging to David. We up on a new patch of reef we had never been to and I was out about fifty metres or so from everyone else. The water was glass clear and about three meters deep over clean white coral sand. To one side there was little coral outcrop or bommie. I looked up from my slow movement through the water and saw about a three metre shark (bronze whaler? ), slowly coming towards me. It was not deviating from its course. I calmly drew in my speargun, detached my spear point on the spear and quietly screwed on my powerhead. The shark silently closed more distance. I was uncertain as to what to do, as sharks will swim away if not provoked or agitated. The shark came closer and closer. When it was about two and half meters away, I calmly raised my speargun, pointed it at the sharks head and pulled the trigger. The thick rubber band on the speargun propelled the loaded spear shaft and powerhead with great force into the head of the shark. There was a dull thud as the powerhead exploded into the shark. The shark immediately stopped swimming and sank to the bottom with gaping hole in its head. I then proceeded to retrieve the shark and to drag it to the shore. I was studying animal physiology at university for my B.Sc. degree so I could use it as a specimen. This incidence had happened so quickly. It is how to get the adrenaline really running in one morning. Coral Canyon: I was out snorkeling and spearfishing over the edge of the reef one afternoon. The tide was full in over the reef. Where we were, the reef came up in a series of narrow coral canyons to the exposed reef. The canyons were surrounded on either side with high coral ridges with a flat sandy valley in between. In one particular canyon, there was an isolated coral ridge between two flanking coral ridges. Through this isolated ridge was a bridge of a coral to one of the flanking ridges. Through this bridge, ran a tunnel of coral about three metres in length. Two weeks of diving and snorkeling had left me very fit and my breath holding capacity was very well developed. The water was glass clear. I snorkeled down about two metres under the surface and slowly and leisurely finned through the coral tunnel. I came out the end of the tunnel with a real sense of achievement ! The Camp and Meals: We all took turns to help prepare the food as we all had communal meals. It was the job of a few of us to catch the fish for the meals. Rodney had brought a big sheet of steel plate as a BBQ plate over an open fire …. Every night we had the best of reef fish like red emperor sweetlip fillets for dinner. One afternoon, I was about to leave with the fishing party to do the daily fishing. The tide was just right over the reef flat Gail and some the other girls were starting to prepare the night dinner when Gail asked for my joint help with what they were doing as it was supposed to be my turn. As I said I was going fishing with everyone at that moment, Gail was really cross with me. Tryon Island, Trip 2: Just on the south – eastern horizon was a very small adjacent island … barely visible to our gaze ….. David Pritchard had an inflatable boat with two outboard motors, one going and one a bit unreliable. Rodney, David and I decided to make a day trip to the island to see what it was like …. The night before we were due to leave, the reliable motor started missing and being a problem so David and Rodney worked on the other one and got it going OK. We set off in the morning for Tryon Island across the rolling swells of open ocean towards the sandy and green sliver of the island … it was with some apprehension that we progressed along as we didn’t know if this second motor would give us further ongoing troubles. After a few hours of watching North West Island retreat into the distance, we finally arrived at Tryon Island …. Quite different to our island we had come from …… much smaller as it was only a small bump in the ocean …… a sandy island with a small fringing reef … only low shrubs and ground cover … no trees … it had different birds nesting in the bare sand … some sort of tern. We skin dived and fished for a while and finally went back towards North West Island. A very dark storm was brewing over Gladstone on the mainland ….. would we make it back? …. would the motor cut out with the result that we would drift on the wind around the Barrier Reef Area for days? ……. We only had two small wooden oars for rowing the inflatable ….. not very fast action ….. eventually North West Island became larger and larger on our western side …. Eventually we arrived at home ….. were we glad! 1971 to 2017: 45 years on, things have greatly changed. I am still in contact with most of the people who were on these trips. Things have changed a little as there is now a barge you charter that goes regularly to the island and lays out a ramp to the beach. You walk straight on to the island. The former makeshift camping arrangements no longer exists as you need a permit from the Great Barrier Reef Marine Park Authority to be there. To maintain a sustainable future for these Barrier Reef islands, there is now a one hundred and fifty person carefully regulated camping area among the trees on the island There are now brochures on recreational fishing, etc. detailing a tighter control over the island. http://www.australia.gov.au/directories/australia/gbrmpa for Great Barrier Reef Marine Park Authority. Location: Situated north-east of Gladstone, North West Island is the largest coral cay in the area. With surrounding reef, dense tall pisonia forest, nesting turtles and seabirds, this tranquil island is also part of the Capricornia Cays National Park. North West Island offers opportunities for bushwalking, nature study, reef walking, diving and snorkelling. Being a large coral cay it has longer walking opportunities through the island and around its beaches. Fishing is also quite popular on the island. Visitors are requested to limit their fishing and you must only fish in the authorised zones. Please obtain zoning maps from QPWS Gladstone for further details. Composting toilets are available on the Island for the convenience of campers only. Self-sufficient camping is available however, visitors are required to take their own water and a fuel stove. Also be sure to pack sturdy bags to take rubbish away with you. Bookings are necessary before camping and permits can be purchased online at www.qld.gov.au/camping or telephone 13 13 04 or visit QPWS Gladstone.